It's a simple equation. You give a foodie 24 hours in NYC and you better believe that they leave the city with their tummies full. At a little before 11:30-(which is when this joint opens at) my food partner in crime (my dad) and I sat waiting anxiously on the little tan benches in front of this restaurant on 110 East 7th Street, NYC 10000. We were very hungry but knew that we had to pace ourselves for the long food filled day ahead of us. 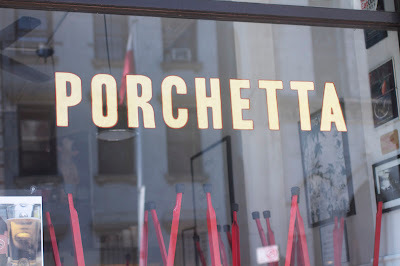 The name of this restaurant comes from the Italian delicacy- Porchetta. Porchetta is essentially a boneless whole pig that is rolled up in rosemary, garlic and fennel and then spit and roasted over wood. Today Porchetta is adapted to be made with different cuts of pork. This was my first meal at Porchetta's. I have heard about it from many people including my foodie dad. This restaurant is incredibly small, cozy, laid-back and delicious! They only make a couple of things, but each thing is made with a lot of care. So enough talking...here is what we got! The beans were good. 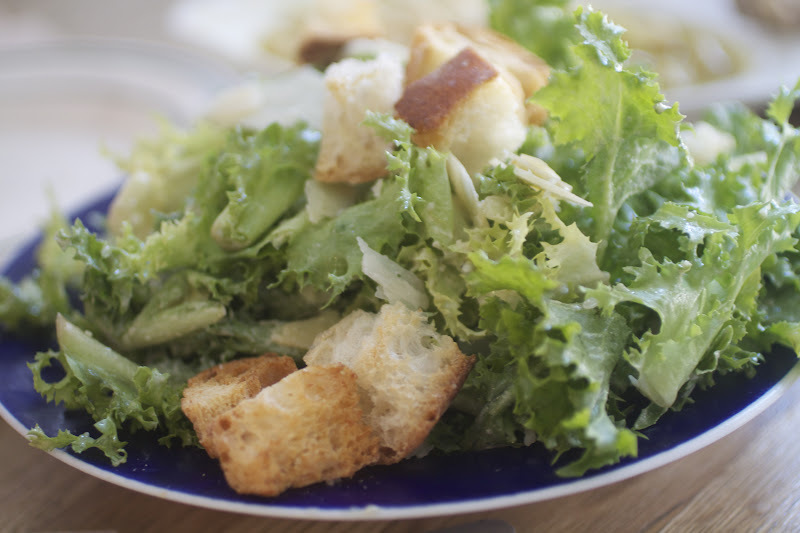 The chicory salad with the garlic/anchovy vinegerette was yummy. 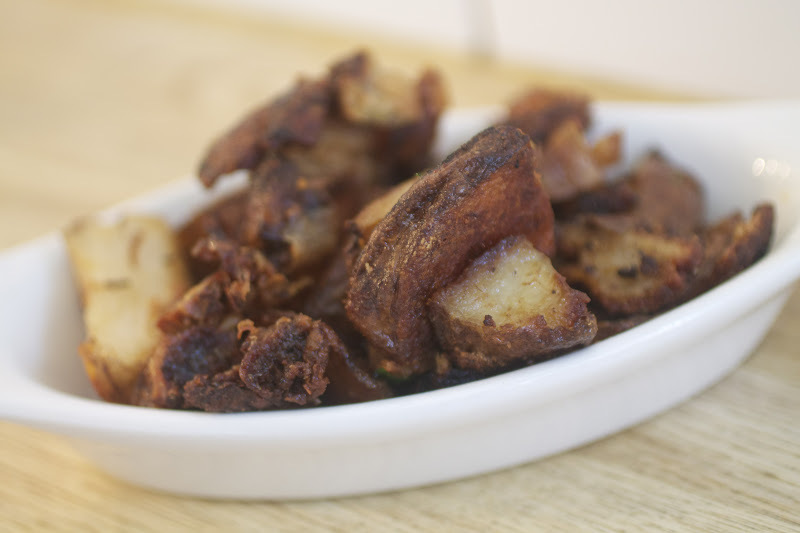 The crispy potatoes with burnt ends of pork were cooked in the pork fat and literally melted in my mouth. 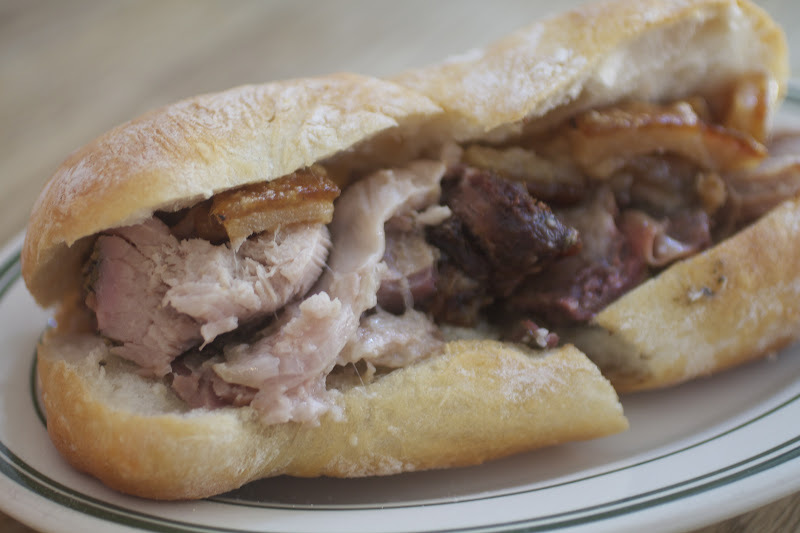 Oh, but then the Porchetta sandwich that was on a crusty ciabatta bread and packed with moist pork with crunchy (and I mean crunchy) skin, was fabulous! I have always wanted to come to Momofuku Noodle Bar. In fact I have always wanted to go to any of David Chang's restaurants. I admire him so much as a chef, restauranteur and business man. The service here at Momfuku Noodle was great. The manger- Adam was so nice to me. I now hope to one day try Momofuku Ko which is a small restaurant that consists of a chef's tasting menu. 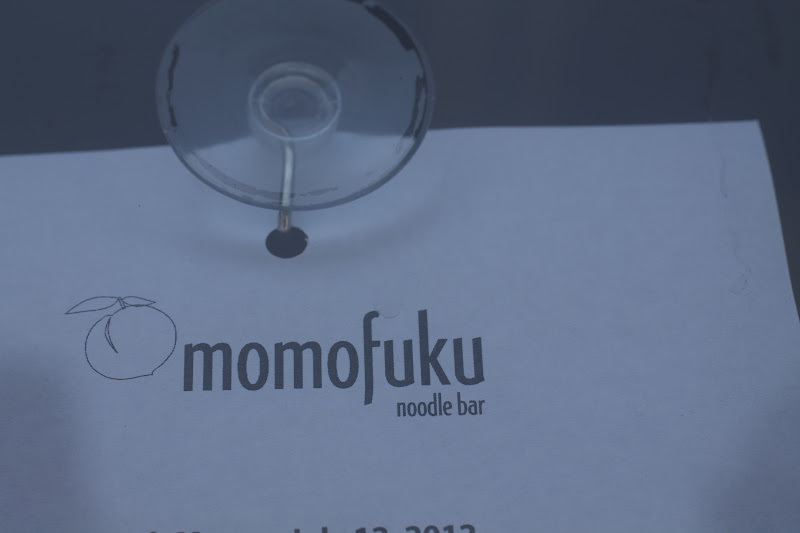 Momofuku Noodle Bar was filled up by the time we arrived and we got there at 12 at 171 1st avenue new york, ny 10003. Here is what we ordered. 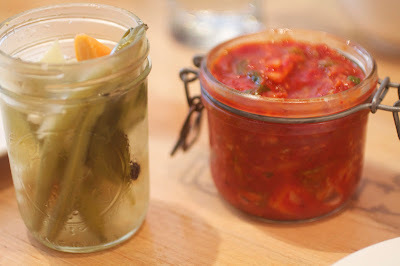 The assortment of pickled veggies served in the cutest little jars was endless! You were never bored with the cauliflower, string beans, carrots, baby bok choy and all the other veggies in the pot! The kimchi was nicely spiced and fermented. 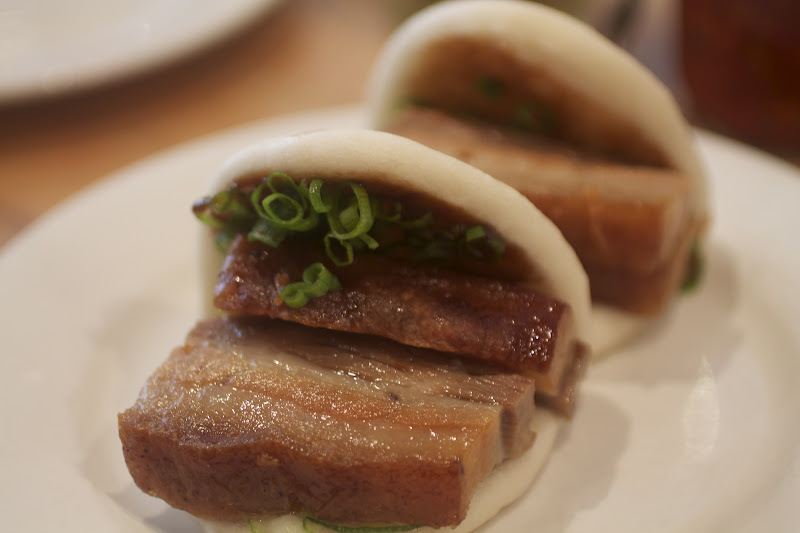 The pork belly buns (baos) were simply delectable. They were SO good I could have kept on ordering more. 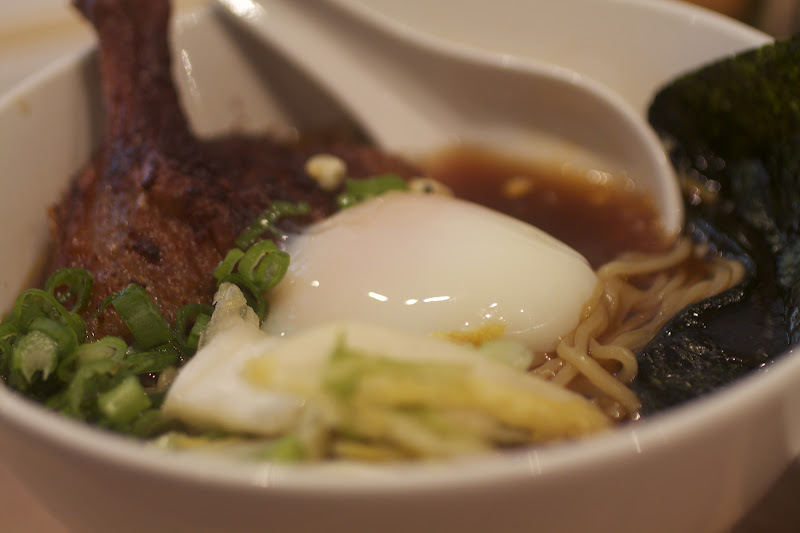 The duck ramen was a special of the day and I loved how comforting the big bowl of noodles, broth and my favorite- the poached egg were. 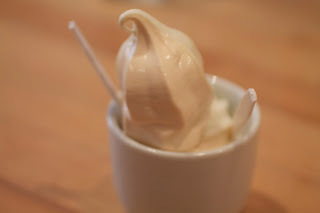 As a little something sweet we ordered the cantaloupe and rosemary soft serve. There was a hint of buttery-saltiness that was provided by the crushed ritz crackers at the bottom of the bowl. It was unique, refreshing and a little bit savory! When going to NYC we always make it a priority to go to one of Bastianich/Batali's restaurants. 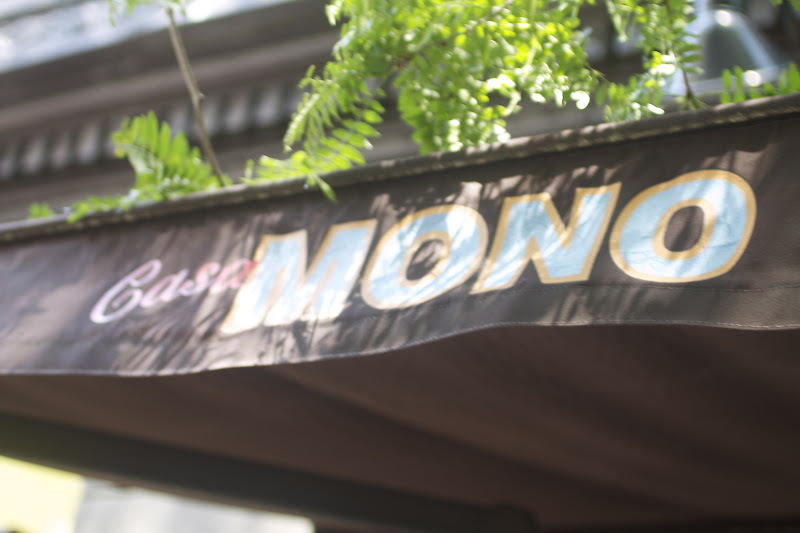 This was my first time at Casa Mono. Here is what we ordered. 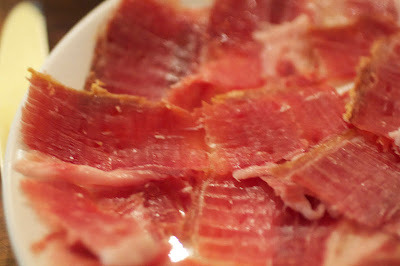 The Jamón Iberico had just enough fat and a beautiful pinkish/red color. The razor clams where so yummy and cooked just enough. 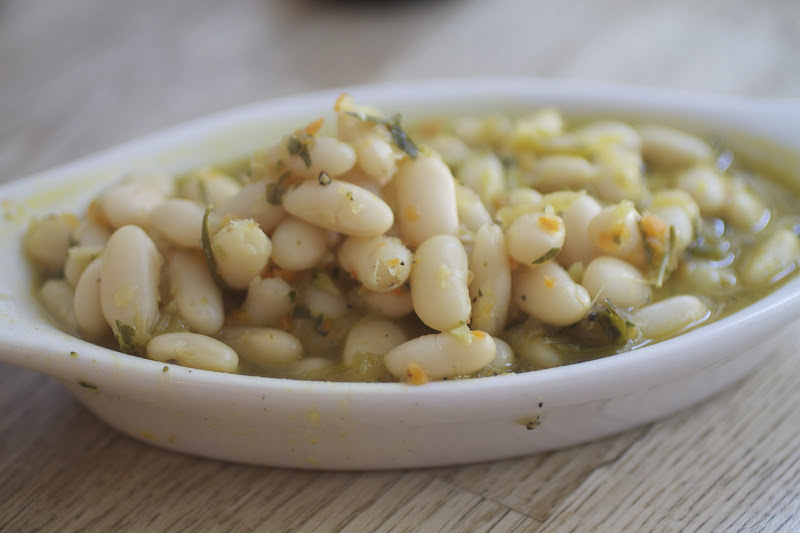 If you have never had the Spanish/Italian salted cod-Bacalao then you need to try it. When you put the cod into a more user friendly dish like Croquetas you will be a converted Bacalao/Bacala lover! The Bacalao is mashed up and creamy on the inside and then breaded and fried with a crispy exterior. 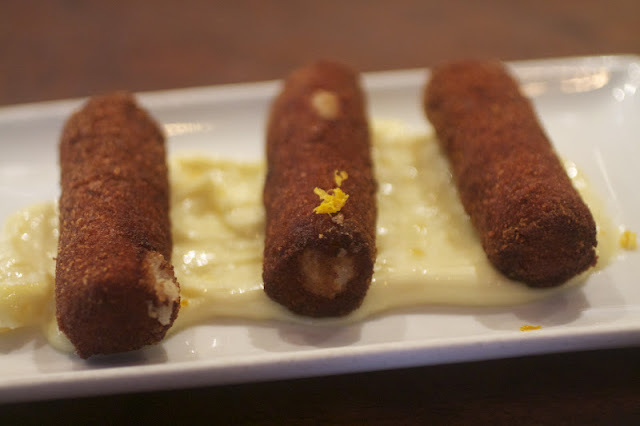 The Croquetas are then paired with a Orange Alioli for a burst of freshness. 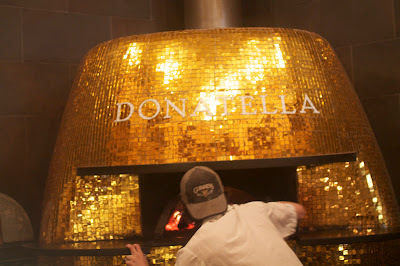 Too full for one of there talked about pizzas but still seeking a snack we stopped by Donatella's. Conveniently located around the Food Network Headquarters (hopefully my future home!) I was in heaven! Donatella Arpaia is a well-known restauranteur, chef and judge for Iron Chef America. I admire her food and business sense very much. We shared this ice cream sandwich. 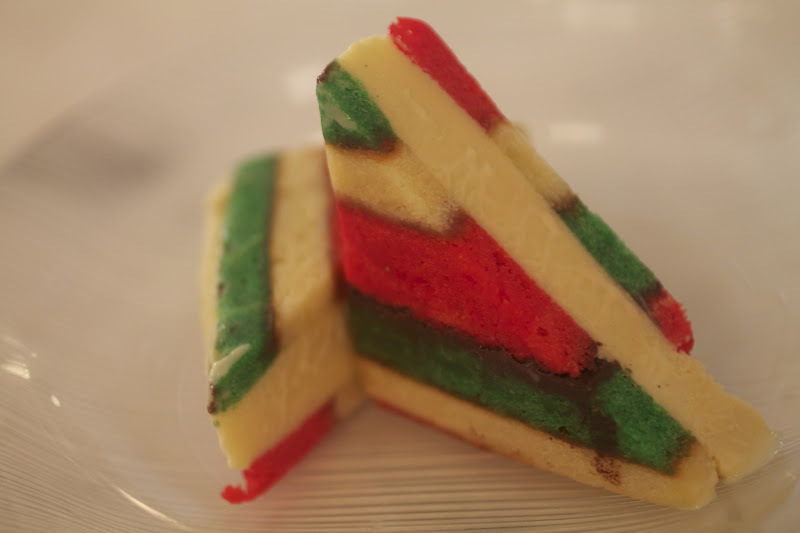 The "cookie" had a slight almond flavor. This ice cream (voted best in the city) was so yummy and pretty to look at! 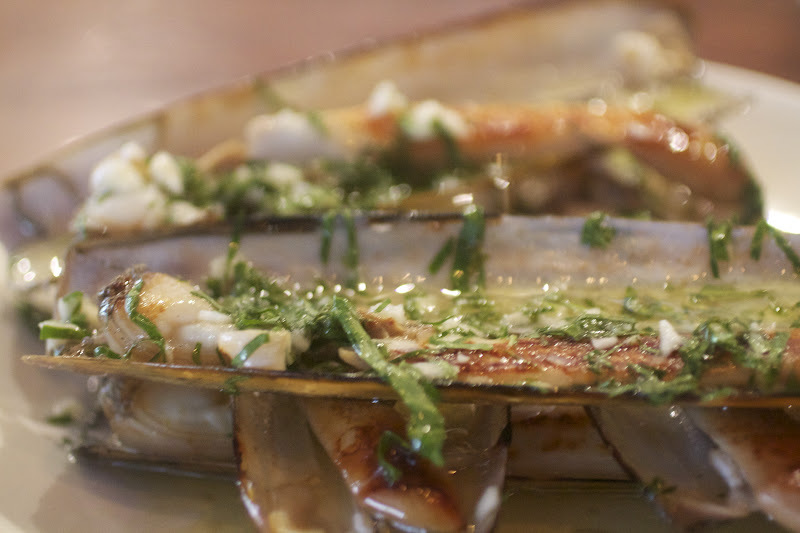 Esca is a fish restaurant in New York. No not any fish restaurant. Once again Esca is a Bastianich/Batali restaurant. The service wasn't as good as usual; however, the pasta dishes were outstanding. 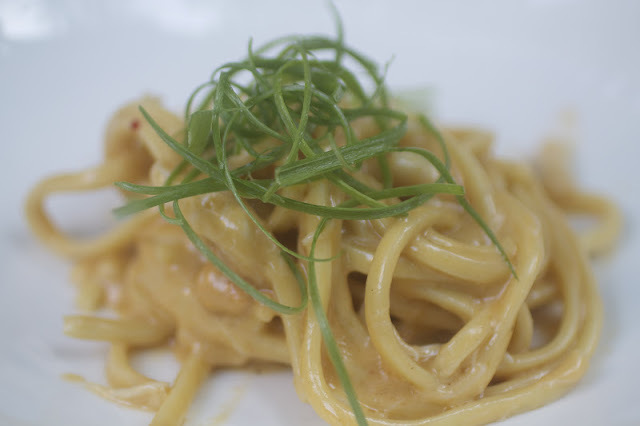 The Spaghetti with sea urchin is a decatant dish. It is rich while still managing to be light. The homemade Spaghetti made all a Chitarra (or guitar cut) is one of my favorite ways to make pasta. 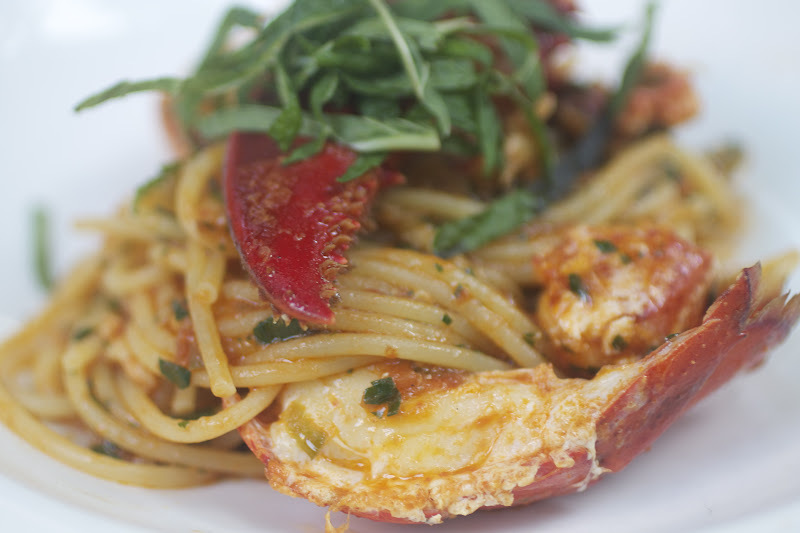 One the other hand the Spaghetti with lobster is unlike any other lobster pasta I have had. 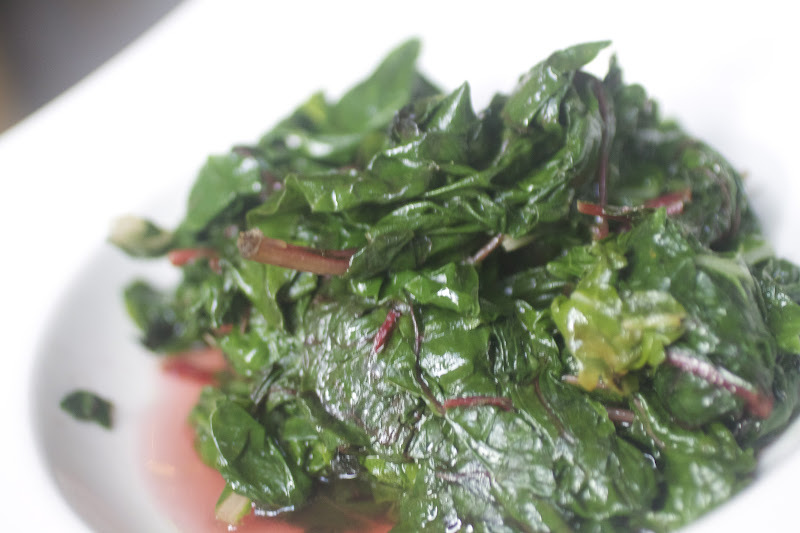 The main reason for this is because this dish is topped with fresh mint. So unique and so tasty! I love Greek Food. In my state good Greek food is hard to find so when we make trips into the city this mediterranean food is a real treat! Milos manages to be one of my dad's favorite restaurants in NYC. This is for a good reason. Milos- which is a fish restaurant has a secret. That secret is getting the freshest food possible and preparing in such a simple way. Walking into Milos you get to see the bustling NY life style. All of the tables were full, yet the employees managed to keep so calm and organized amongst the constant flow of people heading in and out. This is a place you want to be scene. The high ceilings and interior design is something simply amazing. I recommend going with your waiter to pick out your fish. Most of the fish are in an area kept on ice. There is some of the most freshest fish you will ever scene. Some are still alive, some are recently dead. There is common fish and then there is exotic Greek fish. Everything was tasty and simple. 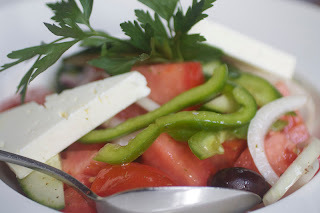 The feta in the greek salad was cut to the perfect thickness. 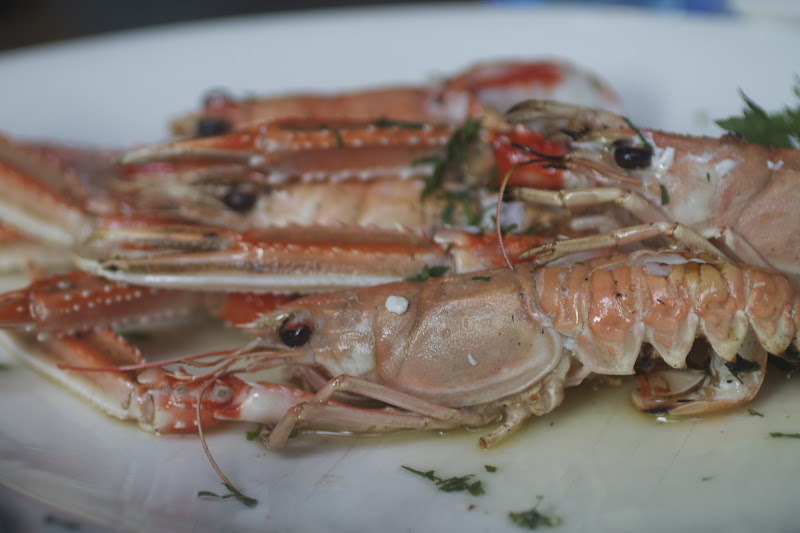 The langoustines were such a real treat. They were succulent and sweet. 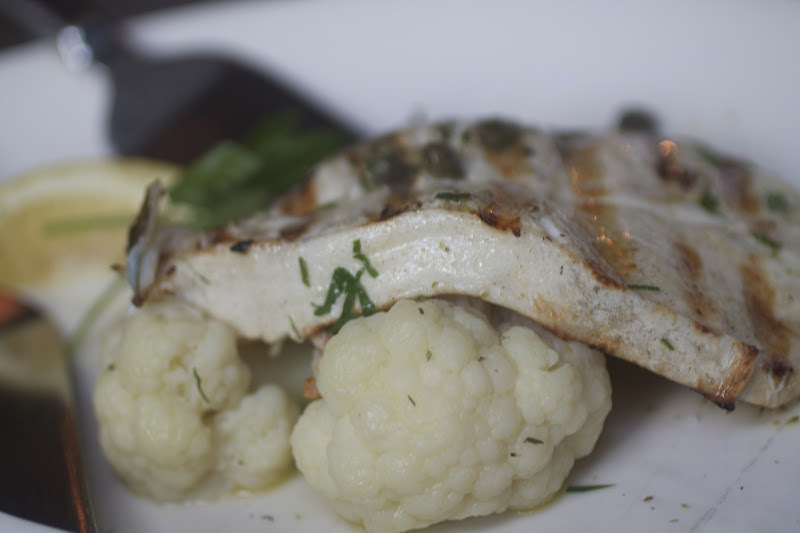 The halibut was cooked perfectly and the swiss chard added a nice brightness to the meal. I should mention that after I went to Momofuku Milk Bar and got pretzel milk, crack pie and a corn cookie; however, due to my excitement I neglected to take pictures!